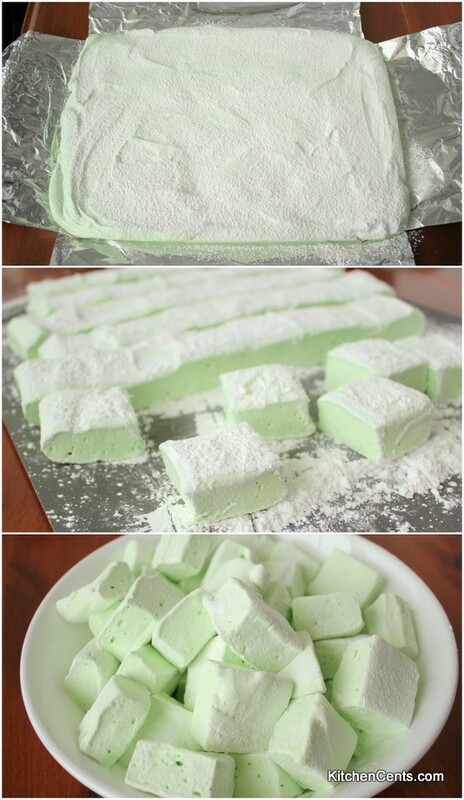 Peppermint Homemade Marshmallows – sweet pillows of fluffy, marshmallow flavored with mint. Any easy homemade marshmallow recipe ready in under an hour. 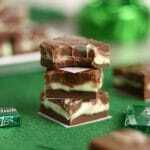 Enjoy these delicious mint homemade marshmallows “naked,” dipped in chocolate, on a stick covered in chocolate or in a steamy cup of hot cocoa. Either way, you can’t go wron. They’re so good and everyone will want more! After you try these homemade peppermint marshmallows you’ll never want to buy store-bought marshmallows again. Partly because peppermint marshmallows are almost impossible to find in a grocery store (I’ve never seen them before) and… homemade marshmallows have a better flavor, texture, and no weird unpronounceable (that should totally be a real word) words listed in the ingredients list. I fell in love with this recipe so fast. 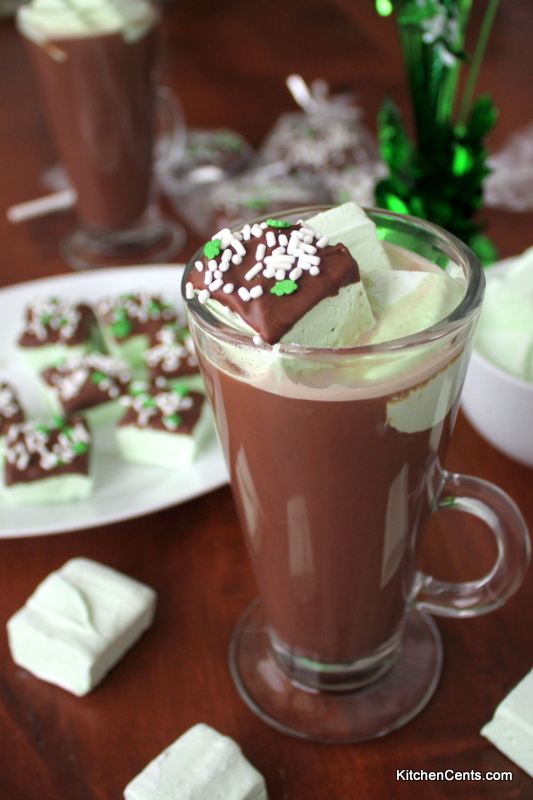 It’s an extremely easy marshmallow recipe and it tastes amazing! 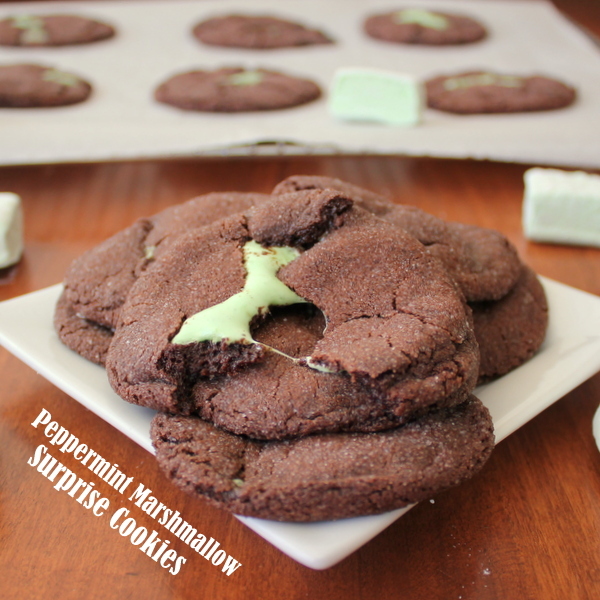 I have two favorite ways to enjoy these: dipped in chocolate and baked inside one of my Marshmallow Chocolate Cookies. The mint adds such an awesome flavor and, did I mention, can be enjoyed year round. If you are looking for a fun holiday (Christmas, St. Patrick’s Day, Earth Day or any other holiday that uses the color green or mint flavor) this is it. But who am I kidding! You don’t need a holiday to enjoy this recipe. Celebrate life and make a batch. You won’t regret it. These homemade marshmallows are such unique yet classic treats. Everyone will love them! 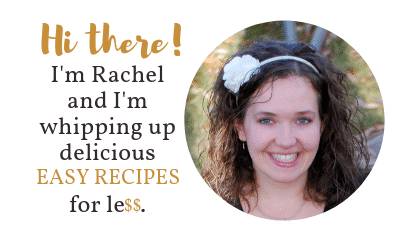 You can find the full printable recipe HERE or by clicking any of the large buttons below. DO I HAVE TO MAKE THESE HOMEMADE MARSHMALLOWS PEPPERMINT FLAVORED? No! If you don’t like peppermint or would like to try a different flavor, feel free. We’ve tried peppermint (amazing and my favorite), vanilla (really good too), cherry ( I didn’t like it but my girls did) and strawberry (this one is great dipped in chocolate). If flavoring as vanilla, use a 1/2 to 1 full tablespoon. 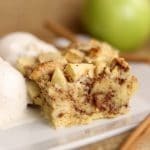 If using a fruit flavor use the same amount as listed in the recipe. Note: cherry oil can be very strong (I used a 3/4 teaspoon for a full batch). ARE THESE HOMEMADE MARSHMALLOWS EASY TO MAKE? YES! 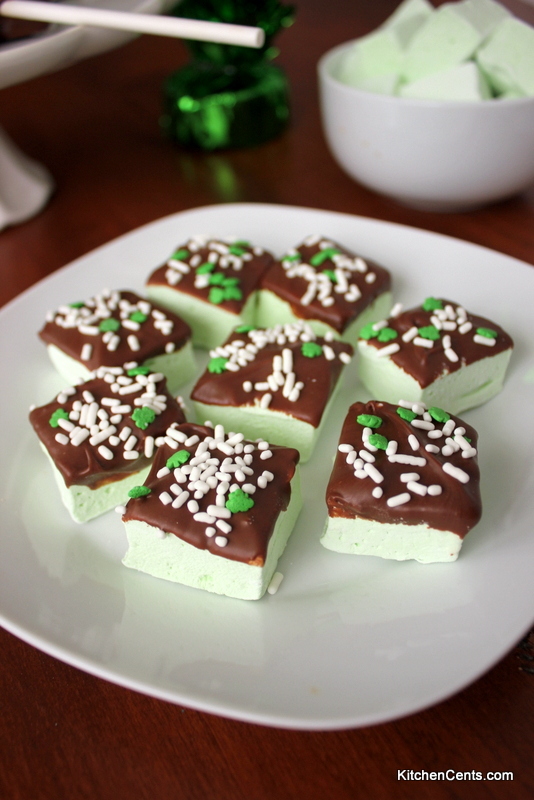 These peppermint marshmallows are so quick and easy to make. It only takes me about 20 minutes to whip up a batch. Once they’ve cooled completely, you can cut and enjoy. Here’s how I make them. 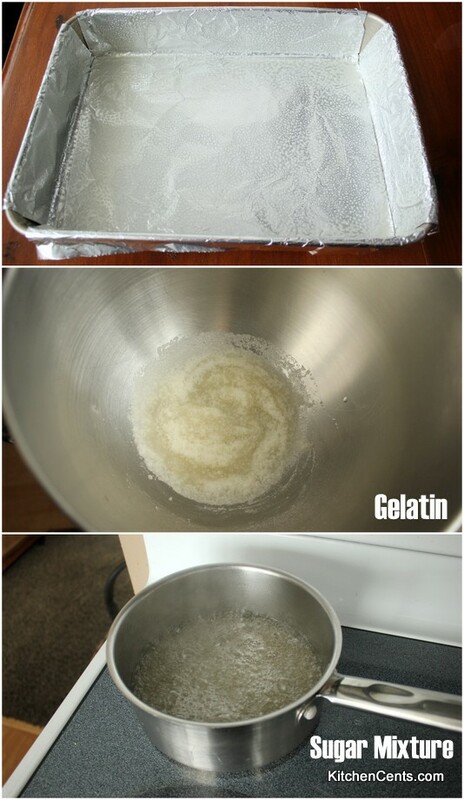 First, begin softening the gelatin in the mixing bowl. Put the remaining ingredients (sugar, corn syrup, water, and salt) in a pan and set over medium-high heat. Prepare the pan the marshmallows will cool in by covering it with an aluminum foil sling (letting the foil hang over the edges) and spraying with oil spray or pan spray. This will help when you’re ready to pull it out and cut it into squares. 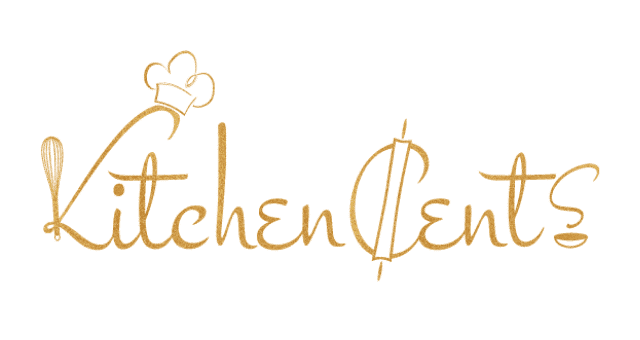 Once the gelatin has softened for 10-15 minutes and the sugar mixture reaches 240 degrees Fahrenheit, it’s time to whip it. I like to break up the gelatin mixture then slowly pour in the sugar mixture while my stand mixer (with the whip attachment on) is on low speed. Once all the sugar mixture has been poured, crank up the speed to high. The mixture will be kind of smelly and turn a shiny white. 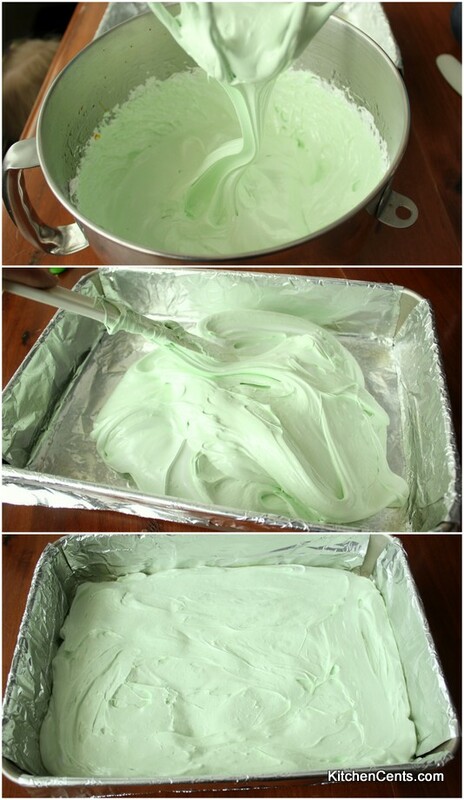 Whip the mixture for 8 minutes then add the peppermint and food coloring and whip for 2 to 4 more minutes. Just a side note. You want the mixture to cool but still be slightly warm when you are ready to pour it out into your prepared pan. If it is too cool, it’s really hard to pour out and smooth. Once the marshmallow has mixed for 10-12 minutes, pour it out into a prepared pan. For a thinner marshmallow use a 9×13 inch pan. For a thicker marshmallow, use a 7×11 inch pan. Smooth out and let it cool until set. This takes 6 to 12 hours at room temperature or about 30-45 minutes in the freezer. As the marshmallow cools, the gelatin sets. This is where the marshmallow gets that firm but fluffy texture. PRO TIP: Don’t be afraid to use a lot of powdered sugar! Once the homemade marshmallow is set, sprinkle with powdered sugar. Then, use a large chef’s knife to cut the marshmallow into squares. You can get really creative with this. If you’re feeling it, you could use fun cookie cutter shapes to cut the marshmallow into fun shapes. If you put a metal cookie cutter into hot water for a minute then dry it and use it to cut the marshmallow, you can make super fun shapes. For this, I just did a simple 1 inch by 1-inch square. The list goes on and on. These homemade marshmallows are SOOO much better than store bought marshmallows. The flavor is better. The texture is better! They really are the best! The peppermint marshmallows added just a hint of peppermint. SO GOOD in hot chocoate! 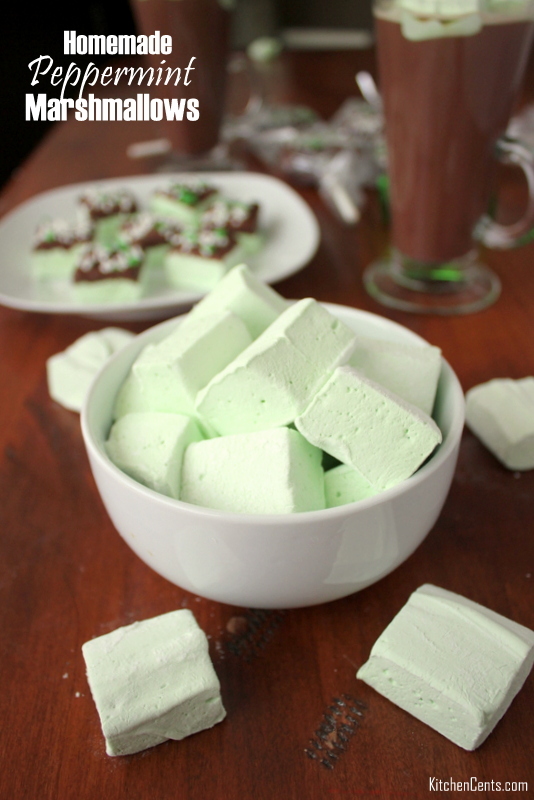 As an added bonus, these peppermint marshmallows melt perfectly. It’s like they add this creaminess. They are incredibly smooth. It probably has something to do with the fact that they don’t have a bunch of added preservatives or processed crap. Ya know? That’s always a good thing, right? 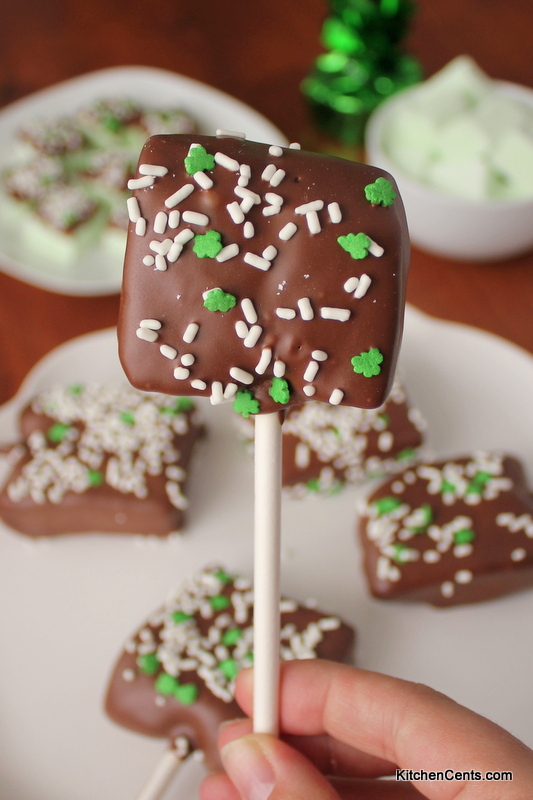 I think my girl’s favorite way to enjoy these peppermint marshmallows is on a stick. 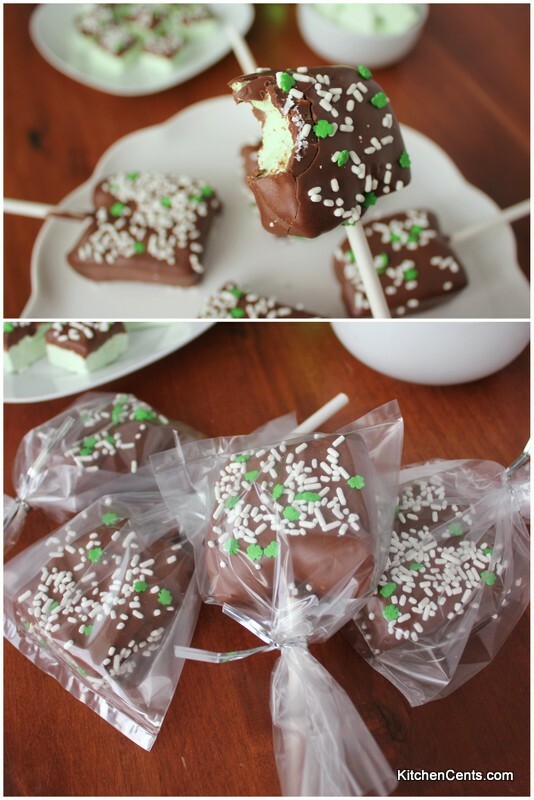 Check out how cute these shamrock peppermint marshmallow pops turned out! We enjoyed a few for ourselves and wrapped a few to share with friends. It’s always fun sharing a cute and delicious holiday treat. 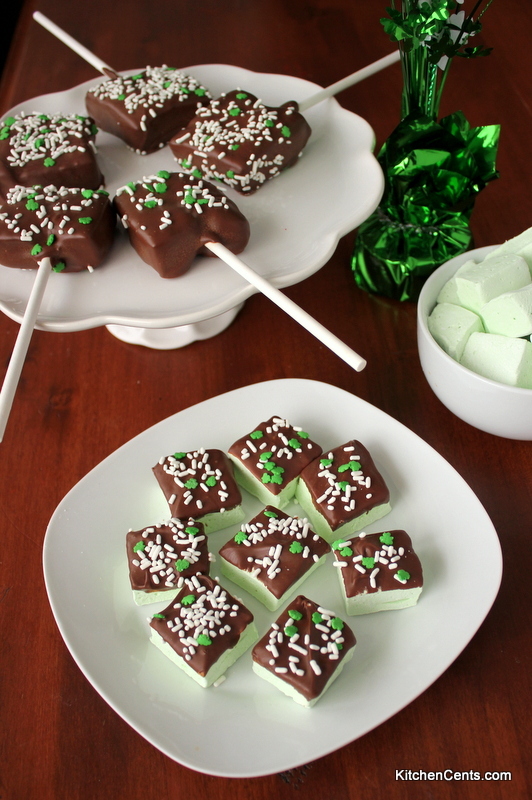 So, whether you enjoy these peppermint marshmallows “naked,” on a stick, covered in chocolate or in a cup of steamy hot cocoa, you really can’t go wrong! I’m so excited for you to try these! HAVE YOU EVER MADE HOMEMADE MARSHMALLOWS? What’s your favorite way to enjoy marshmallows? 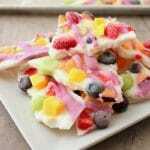 SO EASY TO MAKE!! AND SO EASY TO EAT ALL AT ONCE… haha so yummy!!!!! Haha! I think my girls would eat the whole batch all at once if I let them. 🙂 Thanks for stopping by Jane.